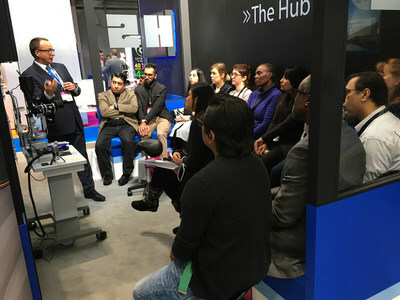 HARLOW, England, Feb. 11, 2019 /PRNewswire/ -- Haag-Streit UK (HS-UK), the leading manufacturer and distributor of gold-standard optometry and ophthalmic equipment, is pleased to announce that Haag-Streit Academy will be holding some exciting on-stand CET sessions at Optrafair 2019. Haag-Streit UK will be exhibiting on stand F32 and Haag-Streit Academy will be hosting a number of clinical education seminars and workshops on the stand during the event. Session topics include; 'Wide-field, Confocal Multimodal Fundus Imaging', 'Binocular Vision' and a 'Slit Lamp Masterclass'. 'Wide-field, Confocal Multimodal Fundus Imaging' will be hosted by Grant Duncan, HS-UK Clinical Training Manager. The session will cover the definition and advantages of confocal imaging, wide-field imaging and the key clinical applications. It will be held on Saturday 30th March between 10am and 11am and Monday 1st April between 12pm and 1pm. Each delegate who attends the session will receive a FREE copy of CenterVue's 'Clinical Atlas'. The 'Clinical Atlas' is a 96 page hardcover book featuring a series of interesting clinical cases, collected by retina specialists, that show examples of the Eidon's superior imaging capabilities. 'Binocular Vision' will be hosted by Sam Laidlaw, HS-UK Product Manager. This will include understanding common binocular vision conditions and a discussion about practical clinical techniques. The session will run between 2pm and 3pm on Saturday 30th March and between 10am and 11am on Sunday 31st March. Finally, the 'Slit Lamp Masterclass' is a demonstration workshop which will be facilitated by experienced Optometrist, Kirit Patel, Radlett Opticians, and will cover effective examination of the patient and illumination & magnification techniques. It will take place between 2pm and 3pm on Sunday 31st March and between 10am and 11am on Monday 1st April. Grant Duncan, HS-UK Clinical Training Manager, said, "We look forward to welcoming delegates onto the HS-UK stand for these exciting CET sessions. Each seminar and workshop is designed to give attendees the opportunity to gain valuable hands-on experience with Haag-Streit UK's state-of-the-art equipment, while learning from specialists in the field." To register for any of these CET sessions, please visit https://optrafair-2019.reg.buzz/ to book your place. For further information on the sessions, please contact Haag-Streit Academy on 01279 881923, or email academy@haag-streit-uk.com. *CET application for Binocular Vision submitted and awaiting outcome. All other CET confirmed.